Creative EP-630 And EP-650 In-Ear Earphone Now Comes In Vibrant Colors and made their first debut at the PC Show 2009, level 6 of Suntec City, Singapore. 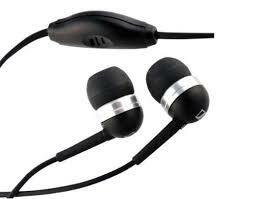 The EP-630 earphones usually comes in black or white have more than 3 million units shipped worldwide in 2008. Since we are now talking about EP-630 earphones, we ever came across another Creative's strong competitors having a set of earphones which resembles uncannily to the Creative's EP-630 earphone. We are talking about Sennheiser MM50. We believe Creative helping Sennheiser to manufacture these same set of earphones and selling them under the brand name Sennheiser. Of course the Sennheiser MM50 cost more than the Creative EP-630. So the quality of the earphones are the same but priced differently. If you are the consumer, do you want to pay more for technically the same set of earphones? Let us know what you think ? MILPITAS, CALIFORNIA - 10 June 2009 - Creative Technology Ltd. today introduced the Creative EP-630 and Creative EP-650 in-ear earphones in new vibrant colors. Widely popular, more than 3 million units of Creative EP-630 earphones were shipped worldwide in 2008. Inspired by the ocean, the new Creative EP-630 color series earphones now come in exciting colors such as Pacific Blue, Atlantic Green, Mediterranean Red, Arctic White and Pearl Black. For a sophisticated look, the Creative EP-650 earphones come in Mercury Abyss, a premium chrome finishing. Offering an unsurpassed music listening experience, the Creative EP-630 and Creative EP-650 earphones are specially designed to deliver optimum performance with any music genre. Powered by quality 9mm Neodymium magnet transducer, the Creative EP-630 and Creative EP-650 earphones offer high-quality audio reproduction with extraordinary bass that is ideal for digital music playback. Complete with the gold-plated 1.2m Oxygen-Free Copper cable that provides uninterrupted transmission of music from the player to earphones, enjoy pristine audio and hear the music in greater clarity. Designed with soft and ergonomic silicone in-ear earbuds, the Creative EP-630 and Creative EP-650 earphones provide excellent noise-isolation. Pick the perfect fit from the additional pairs of alternate sized earbuds that are included. The Creative EP-630 earphones are currently available at the online store at creative.com/shop in US at the suggested retail price of US$39.99 while the Creative EP-650 earphones will be available from mid July onwards at the suggested retail price of US$49.99.